U.S. Department of Agriculture Secretary Tom Vilsack said Friday that Congress must find a better way to pay for firefighting so that the Forest Service can maintain the funding for programs to reduce fire risk. The Forest Service has “sacrificed” its “normal” budget in recent years to fight catastrophic fires in the western U.S., Vilsack said in a telephone interview from his Washington, D.C., office. Generally dry conditions over the past decade have produced high-intensity fires in Colorado and throughout the West. A report prepared by Forest Service scientists for Congress and the White House earlier this year warned that by 2050 the area burned each year by wildfires will at least double, to 20 million acres nationwide, the Denver Post reported in April. If hot, dry conditions persist, western Colorado and other regions will face as much as a fivefold increase in acres burned, the study said. The White River National Forest, which surrounds Aspen and the Roaring Fork Valley, has avoided broad, severe fires with the exception of the Storm King Mountain blaze. Monsoon moisture arrived just in time this year to offset incredibly dry conditions and high fire risk. 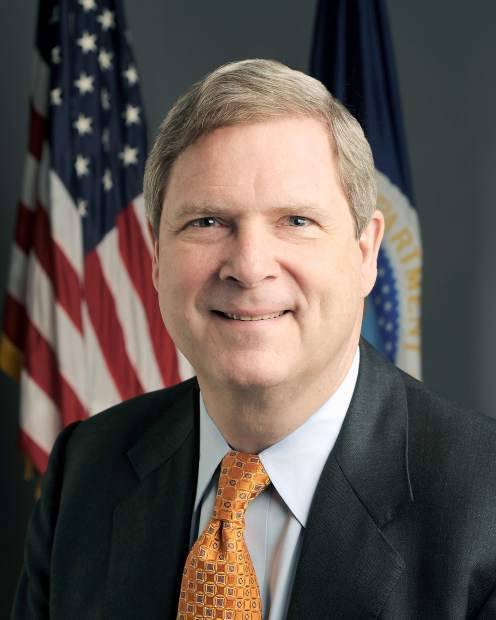 Vilsack said the Agriculture Department recognizes the long-term threat and is undertaking forest management to reduce the risk. About $100 million was allocated for forest restoration after the mountain pine beetle epidemic killed trees on millions of acres, for example, he said. The federal government also has streamlined the National Environmental Policy Act to speed approval of forest-management projects, Vilsack noted. The agency also is devoting funds to research new uses for timber products, he said. The Forest Service is a firm supporter of a biomass plant that opened earlier this year in Gypsum. That plant is producing power by burning trees killed by insects. The White River National Forest provided a long-term contract with the contractor removing the timber. Vilsack said increased opportunities for timber sales can help forest management by responsibly thinning forests. “People must realize we have made steps in that direction in the last few years,” Vilsack said. The challenge won’t be solved overnight, he added. Funding presents one of the greatest challenges. Vilsack noted that when a hurricane or tornado strikes, the Federal Emergency Management Agency is given additional funding to provide temporary housing and help victims in other ways. However, when a catastrophic fire breaks out, the Forest Service usually must dip into its general budget for firefighting funds. Vilsack initiated calls to reporters in rural areas of the country Thursday and Friday to talk about immigration reform. His message was simple: Approving the immigration-reform bill passed by the Senate will benefit the entire country and boost the farm economy of states such as Colorado. The Department of Agriculture sent out a study of the economic benefits of immigration reform. It included a projection by Regional Economic Models Inc. that said the Senate proposal could increase Colorado’s economic output by $617 million and create roughly 7,178 new jobs in 2014. The House didn’t vote on the immigration bill before its summer recess. Vilsack said supporters of the Senate bill need to pressure their members of Congress to pass the bill. Support from areas such as Aspen isn’t enough, he said. “They need to understand the consequences of it not getting done,” he said.